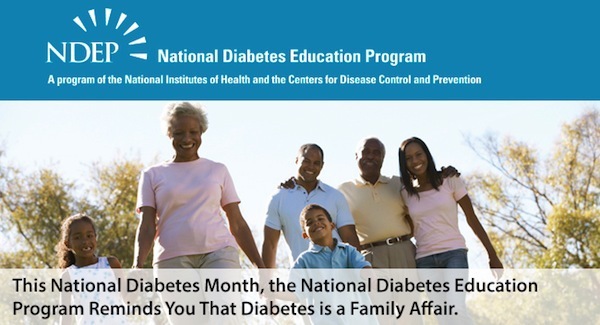 In observance of National Diabetes Month 2013, the National Diabetes Education Program (NDEP) and its partners are reminding people that Diabetes is a Family Affair. Diabetes is a challenging disease that affects the entire family in many ways. For people living with diabetes and their loved ones, family support is very important when it comes to managing diabetes and preventing serious health problems. It’s also important to know that having a family history of diabetes – such as a mother, father, brother, or sister with diabetes – increases a person’s risk for developing type 2 diabetes. Looking for ideas and materials? NDEP has many ready-to-use resources you can use to promote National Diabetes Month in your community – such as press releases, articles, web buttons, social media messages, and more – available at YourDiabetesInfo.org/DiabetesMonth2013.